SKOPJE, Macedonia – The country’s LGBTI Support Center has been set on fire by unknown arsonists. At around 4:20 a.m., on July 5, an unknown number of people climbed on to the roof of the center, punched a hole in the tiles and poured gasoline on the roof planks, setting them on fire. The fire quickly spread throughout the three floors of the building that was unoccupied at the time, with some computers and electronic appliances damaged. According to a police report, Skpoje’s fire brigade received within minutes an unidentified phone call informing of the arson attack, to it promptly responded, and extinguished the fire. The Macedonian Helsinki Committee of Human Rights (MHCHR), which runs the center reported the attack on the building to Macedonia’s Ministry of Culture, as its listed as a cultural heritage. The ministry assured MHCHR that an investigation would be launched. The attack is the latest in a spate of anti-gay violence sweeping through the small former Yugoslav nation, located in the Balkans region of Europe. A little over a week ago, an angry mob surrounded and attacked the home of Petar Stojkovikj, a famous Macedonian openly gay TV star and MHCHR Executive Board member. 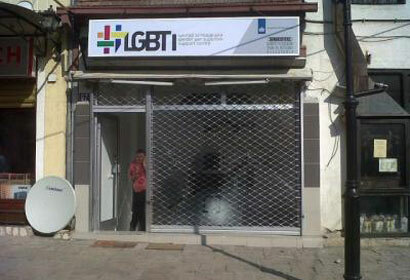 Two weeks ago, the center was attacked with rocks and baseball bats by an anti-gay hate mob, while members of Macedonia’s LGBT community celebrated pride indoors, watching a series of short films. A pride parade was cancelled as Macedonia’s Ministry of Interior said it could not guaranteed marchers’ security. Despite a police investigation, no suspects have been apprehended. According to Stojkovikj, not a single Macedonian official has condemned these attacks, which he alleges were sparked by pro-government journalists inciting anti-gay hate in the media and social networks. The attacks have drawn strong criticism from U.S., European Union (EU), Dutch, German and Swedish diplomats based in Macedonia. Boris Dittrich, Advocacy Director of Human Rights Watch’s LGBT Program said, “Urgent action is needed. The Macedonian authorities need to investigate all the recent violent attacks on LGBT people and the LGBTI Support Center thoroughly in order to bring the perpetrators to justice. “The Prime Minister needs to show leadership and publicly condemn the attacks and explain that discrimination on the basis of sexual orientation is not tolerated,” he said. “Negotiations over Macedonia’s application to join the EU should be cancelled until its government publicly condemns the violence, arrests the perpetrators, and ensures the protection of its LGBT community,” said Tatchell.